My six year old daughter was desperate to learn to surf. Her father is a keen surfer, but ever since an episode in Australia back in 2004 when I nearly broke my nose, I have been a little reluctant; shielding myself from the pursuit with my children. 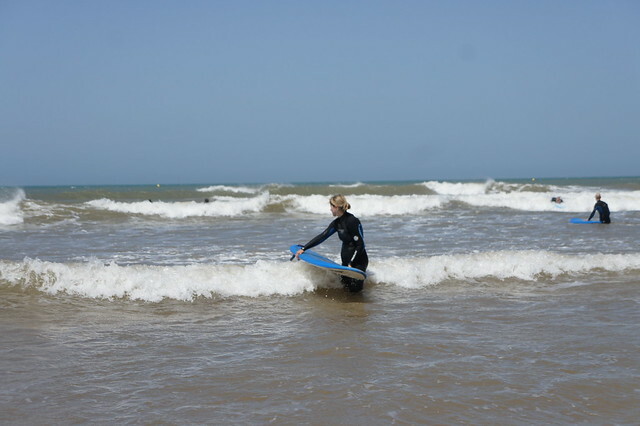 However, in the spirit of encouraging my children to be more adventurous, I was starting to run out of excuses so, when we last went to Morocco, I dusted off my wetsuit and promised that we would have a lesson together. On the morning of our lesson, my daughter woke bright eyed and excited. I was apprehensive. As we walked down to meet our guide, however, it was a sunny day and the sea looked calm and inviting. Too calm, unfortunately, we were forced to abandon our plans and wait for better waves the next day. My daughter was disappointed, I on the other hand, was somewhat relieved at my stay of execution. Tomorrow came quickly, however, and the next day we returned to the surf camp which was alive and buzzing with bodies; surf was officially up. Unfortunately for my daughter, conditions were now too rough and it was judged that she shouldn’t have her lesson, mine, however, could go ahead. She hid her disappointment well, with the incentive on an ice cream her sadness soon abated. 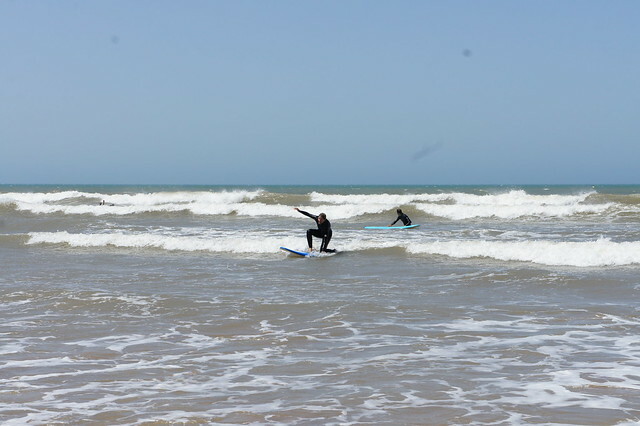 I, on the other hand was now on the brink, forced to be brave and face my surfing fears. The session began with a briefing, going through an assessment of the conditions and safety. They were very thorough and then insisted upon a full warm up before we were to enter the sea. We were then divided up into groups and the more experienced headed off with their guides, I was left for a one on one session, as they could obviously see the fear in my eyes. 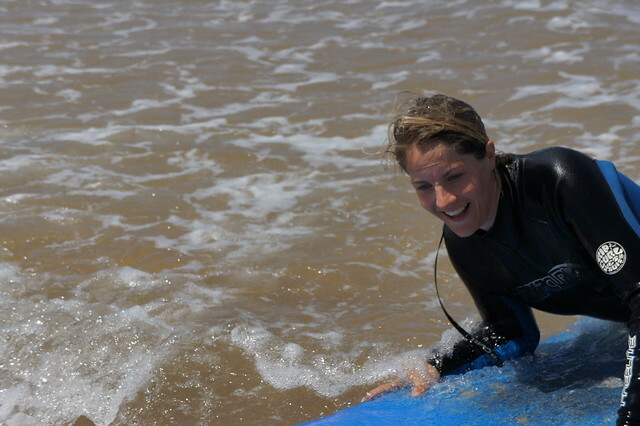 I started off learning the basic techniques and then went into the water to spend some time body boarding, which I absolutely loved. Catching waves and then coasting in to the shallows. My cheer-leading children came along to watch and play on the beach, my husband came to laugh, but I didn’t care, it was great fun. We then turned to the rather more tricky business of trying to get me to stand up on the board – this was my downfall back in 04. However, before even attempting to stand up, I needed to learn how to choose a wave and then catch it. My instructor was most amused by my attempt to catch every wave coming in my direction. Slow down, he said to me, there is always time, there is always another wave. For a working mother of three, there is never time and I am always trying to do a zillion things at once. Suddenly, the opportunity to step back, focus on the waves and wait for the right one felt very, very appealing. I stopped stressing and worrying and just started to enjoy myself, slowing myself down to a surfer’s pace. Catching waves is one thing, standing up is quite another. This isn’t something that comes at once, it takes practice and patience and certainly wasn’t something that I could master in my first lesson. But I had a lot of fun trying (as did my family watching) Being in the sea, focussing on the surf, all my other worries seemed to disappear and I really enjoyed myself.